This issue gave me a fair bit of deja vu…I remember getting #1 and missing #2…so it makes sense that this was my "second" issue of the series back in ’93. Back then with comics, I just went with whatever the "next issue" was in my own possession, and read along and filled in gaps and such. 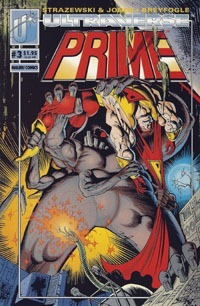 Picking up from the previous issue’s cliffhanger–Prime’s been captured by a creature sent by Doc Gross. Its body went unstable and goopy, so it was able to "absorb" Prime into itself. This makes for a multi-layer thing for Kevin–he’s in full Prime mode, but Prime being trapped inside the creature is like when the Prime body itself breaks down and Kevin has to tear his way out. As Kevin panics, we get a flashback to his earliest experience with a Prime body. We then cut to his parents arguing–his mother freaked out at Kevin’s disappearance, his dad insisting he’ll be ok. Then back to Kevin as Prime–having blacked out for lack of air (he still needs to breathe, even as Prime)–now chained into a huge chair and the Doc throws a switch, zapping him with a lot of electricity. He then monologues, which as exposition fills us (and Kevin/Prime!) in on some of the origin of Prime–he’s the result of genetic experimentation performed for "military application." 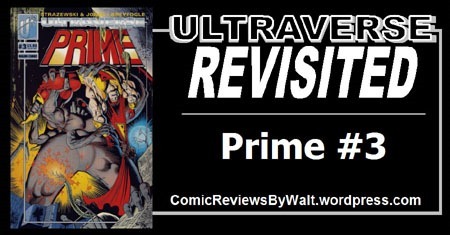 When Prime breaks free of the chair–angry at having been capture, believing Doc’s tale to be lies, etc.–Doc’s assistant, Duey, "Primes up" into a bulked-up body…he’s the result of a much earlier stage of the Doc’s experiments. Duey and "little brother" Prime slug it out for a bit, and Duey manages to do some real damage to Kevin’s Prime body. This damage includes tearing his cape–which gushes goop, as we see that even the clothing is part of the body, and is not spontaneously-generated fabric or such. Lashing out in desperate anger, Prime apparently snaps Duey’s neck, and when he throws him against an electronics panel, it seems to electrocute the Doc, and fire breaks out, leading to an explosion after Prime himself gets out. Thinking he’s killed those people and desperate to find someone to help him figure out what he’s supposed to do, he aims to seek out Hardcase when he spots an old The Squad billboard. Seeing a random tank falling, he redirects to catch it…only to find out he’s ruined a staged scene with the new Prototype–who is none too happy. 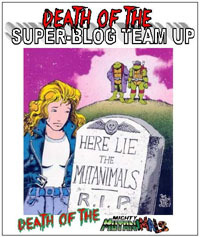 The final page cuts back to Duey and the Doc, showing us that they’ve survived, and something with a "vat" is gonna save Doc. This is a pretty full issue, and fun to revisit. We definitely get a lot of world-building for Prime, showing us Kevin’s first experience with the Prime body’s generation, as well as the monologue as we’re shown that Doc Gross had a huge hand in experiments, of which Prime is apparently one of many. We’ve got resolution of the previous issue’s cliffhanger, and then new action with Duey’s powers revealed; and while it’s rather "convenient" that he just happens to see a video shoot that Prototype’s involved in, we’re set up for them to fight next issue. This also takes the world building from being simply Prime in isolation to showing that he truly is part of this shared universe, beyond seeing a poster on a wall in the background or some billboard or news reference–this is ACTUALLY Prime directly coming into contact with another character with another title. Prime seems rather brash and immature…but then I remind myself that he’s actually Kevin Green, a 13-year-old kid, and he’s WAY out of his league here, facing actualities that he’s only dreamed of or seen on tv or in comic books. That goes along with the character’s over the top visuals–the muscles with muscles–influenced by his imagination but not mattering that much confronted with "real life." I really enjoy the art–it’s not just Prime that’s over the top, but as it’s part of the "point," it works so well. And that Prime and Duey have this "goop" as "blood," they can be shown taking ridiculous damage, with gross explosions of green stuff, and it doesn’t have to be "censored" the way blood would be (not that these titles carry the Comics Code stamp, even though they had some newsstand distribution at first). It’s not hard to follow what’s going on visually, and to "hear" some of the sound effects and such as I read, thanks to the CD-Romix of the first issue. I read this in 1993, as a kid, having read the first issue and not the second…so it’s certainly doable that way. But I’d recommend getting the first couple issues to go with this, as opposed to seeking this out as a single issue to read. Given 40+ issues of Prime exist, unless you’re going for the random single issue "in isolation" experience, or filling in a missing issue in a collection…start at the beginning and definitely read this as part of a cluster of issues. I’m looking forward to the #4s for the original titles: the next issue of Prime has Prototype, and I believe Hardcase and The Strangers have a crossover as well! "Three months in" and along with the establishment of the individual titles/characters, we’re getting the establishment of the universe in general and seeing things start to mix…which is where the Ultraverse becomes so much more interesting than just these individual characters.